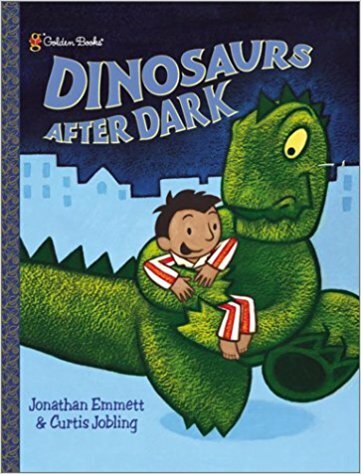 Adventures In Storytime (and Beyond): We Love Dinosaurs! I think almost everyone is fascinated by dinosaurs as a kid, and some of us never outgrow it. I had a serious interest in paleontology, but realized it wasn't the most practical career choice. But I still love dinosaurs, and do at least one round of dinosaur stories every year. We started with our welcome song, then I introduced the topic, and quickly moved to our story song before they could get too worked up since they were all sitting so nicely when I got there. 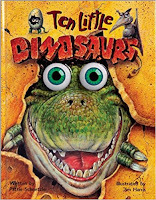 For our first book I choose one that is kind of silly and always attention getting, Ten Little Dinosaurs by Pattie Schnetzler and Jim Harris. I love this book! 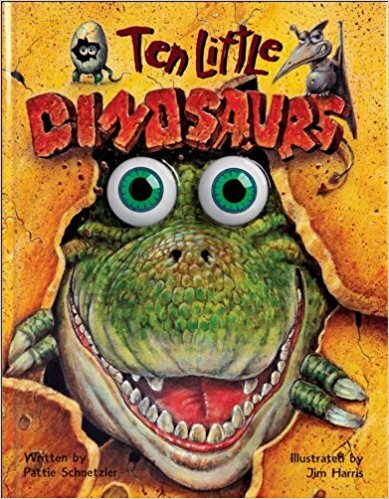 It is fun to read, and has wonderful illustrations, and counts down from 10 to 0 with rhyming quatrains, but best of all, it is big spherical wiggly eyes that really bring the dinosaurs to life. Each page has die cut holes for the eyes to fit through, so each dinosaur has them. The kids love this! It is a bit of a pain when it comes to shelving or stacking this book, but so worth it! There are other versions without the wiggle eyes that would be more practical for shelving in a circulating collection, but for an office or personal collection, I would definitely want the eyes! I followed that with the "Ten Big Dinosaurs" counting song to count up to 10, then back down, for extra counting and fine motor practice. The all lived a long, long time ago. Now there are no more. 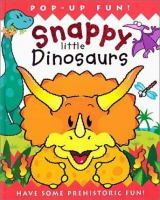 Next up was another fun book kids always love, Snappy Little Dinosaurs by Dugald Steer. If you don't already know, the Snappy Little... books are a great series of pop-up books on many different subjects. I think they are currently out of print, but you could try buying used copies, just look for sellers that have high ratings and clearly describe the condition of the pop-ups. This book has big, bright pop-ups, along with the scientific names for each dinosaur and a rhyming text. Sometimes I read the text, sometimes I just show the pictures, have them repeat the name, and talk about the type of dinosaur (which is what I did this time). And some flew, you know. Our last story was Dinosaurs After Dark by Jonathan Emmett and Curtis Jobling. Little Bobby is in bed when he hears a noise outside. When he looks outside, he sees a dinosaur walking by! Bobby rushes out and follows him downtown, where there are dinosaurs everywhere. First they want to eat him, but then decide to let him play for a while first. A cute story with bright, simple illustrations with black outlines, and a twist at the end. The kids may not get the twist at the end, or may not agree on what it means, but either way it is still a cute story that they will enjoy. I finished up by re-iterating that dinosaurs are now extinct, and all we have left is their fossilized bones. I explained that "fossilized" meant the bones had been changed to stone, and went on to tell them that bones weren't the only fossils that dinosaurs left behind; there are also fossilized eggs, and fossilized dinosaur......POOP! I told them it even had a special name, "coprolite", and reminded them since it was fossilized that meant it had turned to stone, so it wasn't messy or stinky anymore. Then we sang our closing song and passed out stickers. Today was an awesome storytime! Probably one of the best in a while. When I got there the kids were all seated and waiting for me, very calm and quiet, and they did a much better job listening today than the last couple of times. Of course with a theme of Dinosaurs, they did get a little loud out times, but were never out of control. The LOVED the Ten Little Dinosaurs with the big googly eyes and all the sillyness, and cracking up laughing hysterically everytime I turned the page. The also laughed at how each dinosaur was called a silly name, like "bonehead" for Pachycephalosaurus and "nut brain" for Stegasaurus, and I paused to explain how those names were based on characteristics of each dinosaur. Snappy Little Dinosaurs was a big hit, too, with the pretending to be scared as each one popped out at them. They didn't really see the twist in the ending of Dinosaurs After Dark, but enjoyed the story anyway. And they had a lot of fun acting like dinosaurs with the songs and rhymes.